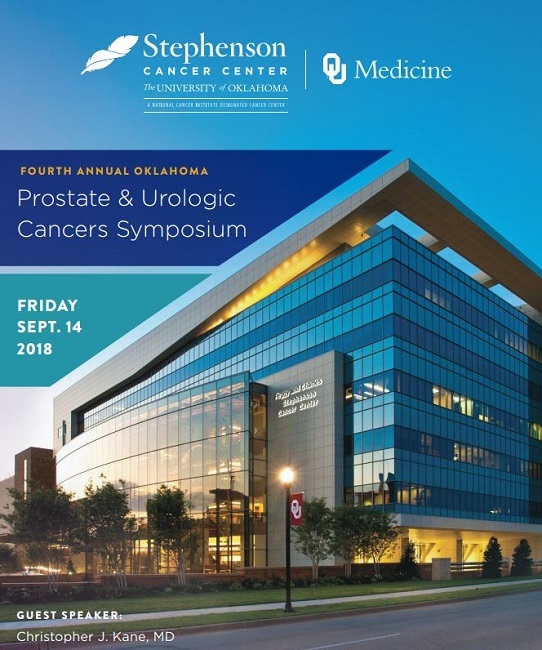 This single-day program will consist of lectures and case discussions highlighting a multidisciplinary approach to urologic cancer care and integration of new technology in the evaluation and treatment of prostate cancer and urologic cancers patients. Evidence-based medicine highlighting relevant clinical trial data will be provided as well as focusing on current controversies in prostate cancer management. Also, highlight development in surgical management including robotic-assisted radical prostectomy. Distinguish advanced surgical techniques using robotics in the management of patients with prostate cancer. Identify therapeutics for advanced and metastatic prostate cancer. No registration refunds will be made after Friday, September 1, 2018. The University of Oklahoma College of Medicine designates this live activity for a maximum of 5.75 AMA PRA Category 1 Credits™. Physicians should claim only the credit commensurate with the extent of their participation in the activity. It is the policy of the University of Oklahoma, College of Medicine that the faculty and presenters disclose real or apparent conflicts of interest relating to the topics of this educational activity, and also disclose discussions of unlabeled/unapproved uses of drugs or devices during their presentation(s). Set up by 6:15 a.m.
6:30 a.m. - 7:45 a.m.